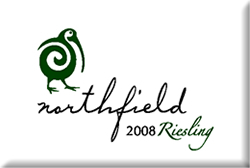 The Northfield Wines collection includes estate grown Chardonnay, Pinot Noir, Sauvignon Blanc/Semillon and Riesling. 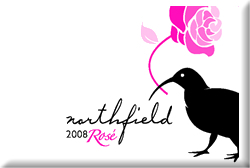 In 2009 we will also have a limited release of our 2008 Pinot Noir Rose. Wine Notes Freshly destemmed pinot noir grapes were cold macerated in open top fermenters. Prior to the start of fermentation a portion of the pinot noir juice was bled off into stainless tanks to complete fermentation. After reaching dryness, a further racking onto light lees for a period of 3 months to provide additional flavor complexity. The wine is light ruby in color with strawberries and cherries on the nose and subtle spices. Lifted berry fruit flavors with crisp acidity and a delicate but juicy palate. Made in a dry style (6 g/L rs. ), the wine is bright and snappy with a refreshing finish. Wine Notes Hand-harvested fruit was gently pressed and settled, then racked to tank with selected yeasts and fermented for 21 days to complete dryness. (1.5g/L rs.) The 2 wines were left on gross less and stirred monthly before blending. On the nose there are hints of wet grass and herbs, peaches and a touch of citrus. Rich body with ripe stone fruit and fresh acidity provide structure; an underpinning of limestone lengthens the finish. Wine Notes Ripe fruit was gently pressed to tank and settled for 48 hours prior to racking. The clear juice was cold fermented until sugar and acid were in balance, and left on fine lees until bottling. The resulting wine has lifted notes of orange blossom, grapefruit and lime. 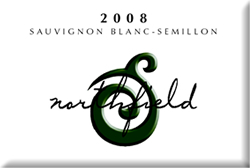 Rich on the palate with citrus flavors and hints of nutmeg and wet stones, refreshing acidity and a lingering finish. Wine Notes The grapes were hand picked then gently destemmed and pressed to tank. A small quantity of cloudy juice was transferred immediately to barrel for wild ferment with the remainder allowed to settle for 48 hours. Once clear, the juice was placed in French oak barrels and puncheons, and fermented with selected yeasts. The barrels were stirred periodically and spontaneous malolactic fermentation was allowed in 70% of the barrels. In late February the wine was reblended and bottled. The resulting wine is bright with pronounced aromas of ripe apple and nectarine. Lots of lush fruit on the palate balanced by refreshing acidity, with hints of toast and vanilla. With good structure and developing complexity, the wine should cellar well and is ready to drink now. Wine Notes The grapes were destemmed into open top fermenters and cold soaked for 7 days. The must was hand plunged 3x daily before innoculation with selected yeasts. The ferment lasted 6 days after which the tanks were capped and left to rest for 10 days before the wine was gently pressed directly to French Oak barrels. (40% new) Malolactic fermentation was completed and the wine was racked and bottled in early March 2008. The resulting wine is a deep purple with pure fruit aromas of black cherry and plum. The tannins are smooth and ripe and the fleshy fruit flavors carry onto the palate with juicy acidity and a hint of spice. Well balanced and rich bodied, the wine is ready to drink now or cellar for the next 3-5 years. Wine Notes The grapes were hand picked then gently pressed and settled. Fermented 100% in stainless steel the fruit's aromatic freshness has been preserved through the use of cool vinification temperatures. Four months on gross and fine lees during fermentation and aging have added weight and complexity to nose and palate. A wonderful seam of limestone underpins crisp green fruits. Drink now and for the next 2 years. Wine Notes The grapes were picked at peak ripeness in the early morning and then gently pressed. The juice was settled clear before fermenting in stainless using selected yeasts. At the precise point of balance between acidity and sweetness the ferment was stopped and left to rest on gross lees. The wine was then racked onto fine lees for a further 6 months before clarifying and bottling. The wine has fresh acidity, ripe juicy stone fruit flavors, with weighty mouth feel and a honeyed finish. Drinking well now, but with the acidity to cellar. Wine Notes The grapes were hand harvested at optimal ripeness and gently pressed into chilled settling tanks. The juice was racked on the lees to new 500L French oak barrels and hand stirred. The wine went through a complete malolactic fermentation. Following bottling in February, 2007 the wine is bright and clear with a deep lemon color. On the palate there are ripe flavors of apple and nectarine with a hint of pineapple. There are notes of toasted hazelnut and spice, and a creaminess that persists through the lengthy finish. Drinking well now and for the next three to five years. Wine Notes The grapes were hand picked and crushed at the end of each day into 5 ton fermenters. The must was hand plunged for 12 days during fermentation then pressed off the skins into French oak barrels. (35% new) The wine was bottled in early March 2007. The color is deep ruby with pronounced aromas of ripe strawberry and black currant. There are developing notes of earth and spice, a medium body and a refreshing acidity that complements the supple tannins. Drink now or cellar for the next three to five years. Wine Notes The grapes were hand picked then gently pressed and settled. The juice was racked on the lees to 25% new French oak barrels. After regular stirring and partial malolactic fermentation the wine was reblended and bottled in February 2007. 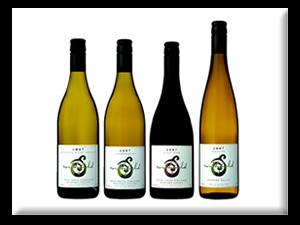 The wine is pale straw in color with aromas of ripe apple and tropical fruits. There are developing notes of toast and baking spice. On the palate the wine is medium bodied with pronounced fruit, crisp acidity and a long, silky finish. Drink now or cellar for up to three years. Wine Notes 2005 was the first year we picked Chardonnay from this vineyard for wine production. The bunches were hand picked, and were very small but juicy and concentrated with citrus and apple flavors at harvest. After gentle crushing, the must was racked with the lees into French oak barrels. After regular stirring and full malolactic fermentation the wine was bottled in May 2006. The wine is straw colored with bright citrus notes and a hint of white peach. On the palate there are hints of tropical fruit, a touch of nutmeg and creaminess to the body followed by a rich finish. Delicious now and for the next two years.